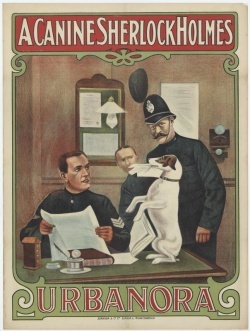 A Canine Sherlock Holmes is a British silent movie released in 1912, produced by The Charles Urban Trading Co., directed by Stuart Kinder, starring Hawkshaw the Detective and Spot the dog. Black & White. Hawkshaw the Detective was a comic created by Gus Mager, very popular between 1910 and 1925 as Sherlocko the Monk and from 1922 to 1951 a Hawkshaw. Survival status: Print exists at EYE Filmmuseum in Amsterdam. When villains use poisoned coins to rob a bank, the authorities send for Hawkshaw the detective to track them down. 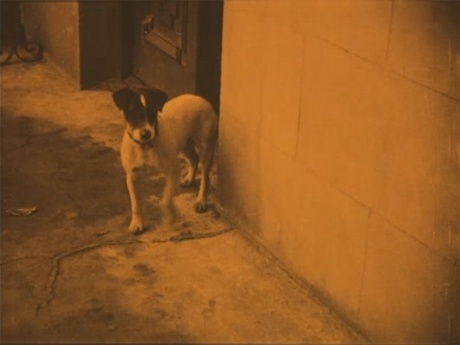 Thanks to Spot's sense of smell, the dog finds the robber's house. 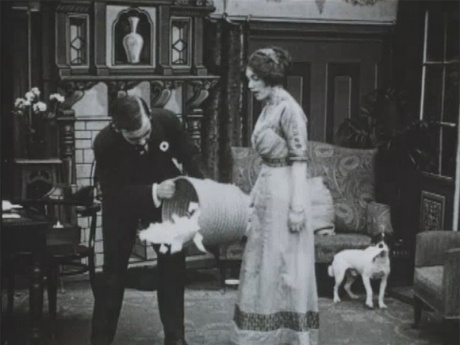 The dog simulates a wounded leg to be introduced in the house. Inside he steals an envelop where the address of the house is written and leaves the house. 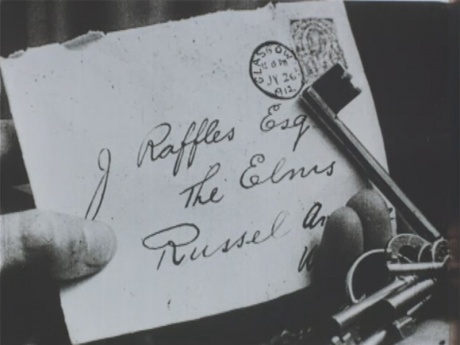 He gives the envelop to Hawkshaw. 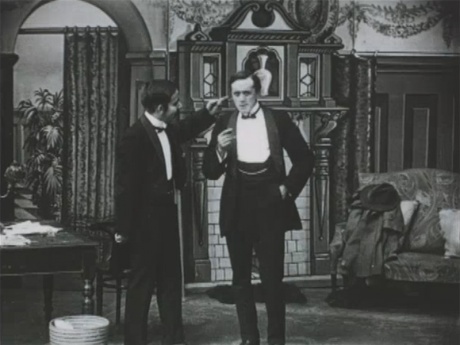 The detective and the dog go to the robber's den. 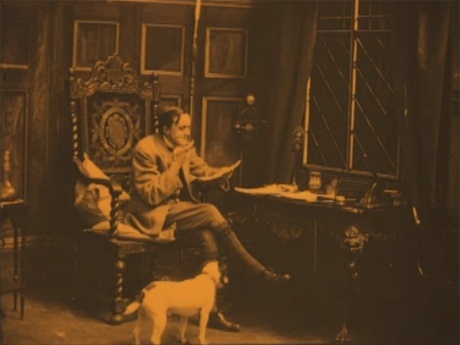 After a fight with the robber, Hawkshaw writes a letter to the police and sends Spot. 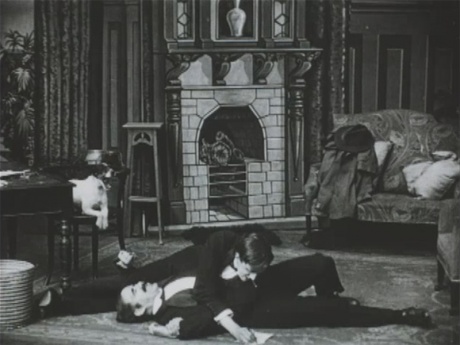 In the meantime, accomplices come to the rescue of the robber and they shot Hawkshaw. The police arrives and the accomplices flee. 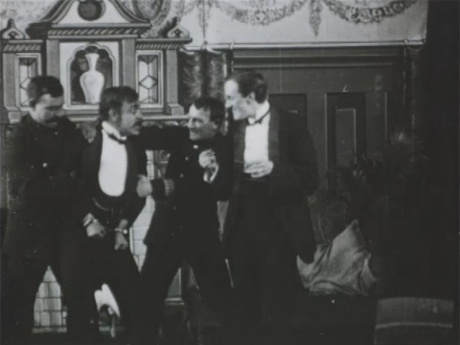 They arrest the robber and Hawkshaw shows his bullet-proof vest. 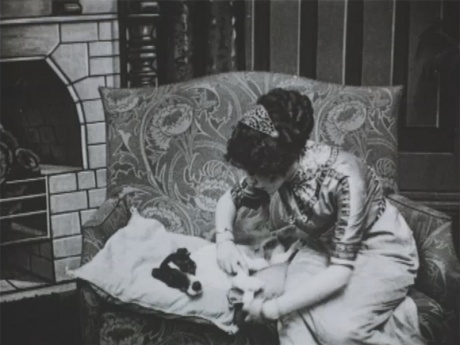 Spot in the robber's house. Spot steals an envelop with the address of the house. Spot gives the envelop to Hawkshaw. 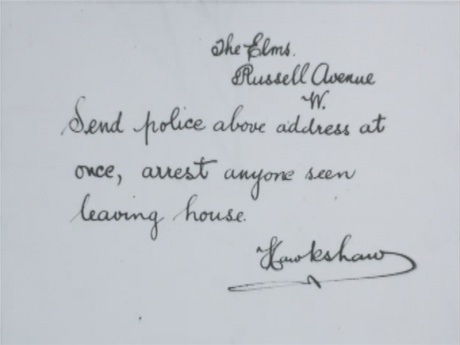 After a fight with the robber, Hawkshaw writes a letter to the police and sends Spot. 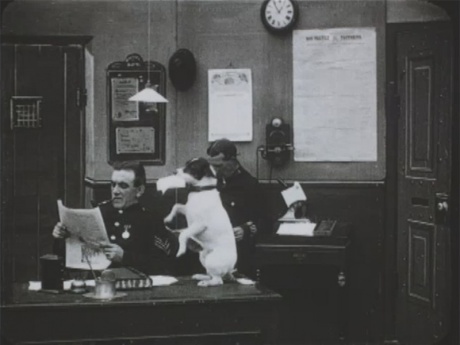 Spot brings the letter to the Police Station. 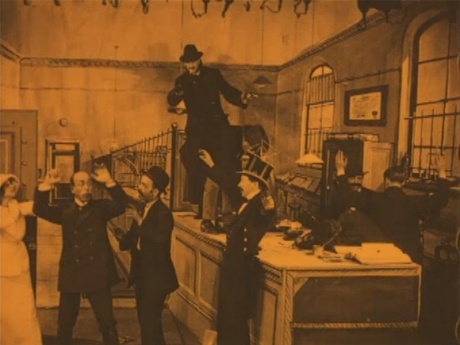 The police arrests the robber. Hawkshaw shows his bullet-proff vest. 4. "If you move within one hour this bomb will be fired by wireless wave and the bank blown up." 5. 'Phone for detective Hawkshaw. 6. Later. Spot on the scent. 8. ... and collects a few useful clues. 9. 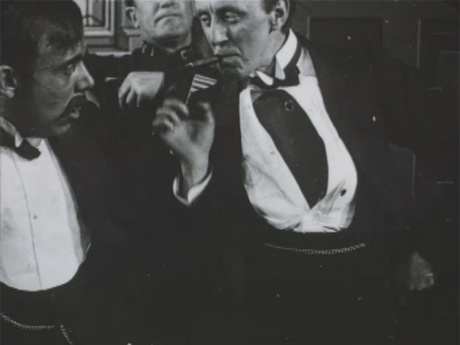 Hawkshaw returns from the theatre. This page was last edited on 22 April 2018, at 23:52.